A new way to see your panoramic images. Is there a better alternative to Panogaea? Is Panogaea really the best app in Image Editing category? Will Panogaea work good on macOS 10.13.4? Panogaea...Discover a new way to see your panoramic images. Everyone loves panoramas but they are always in the same format and have the same look and feel. Panogaea changes everything by giving you control on how to manipulate and distort your panoramas to create fantastic new images. By leveraging the computational power of your graphics card Panogaea enables realtime manipulation of large panoramic images. 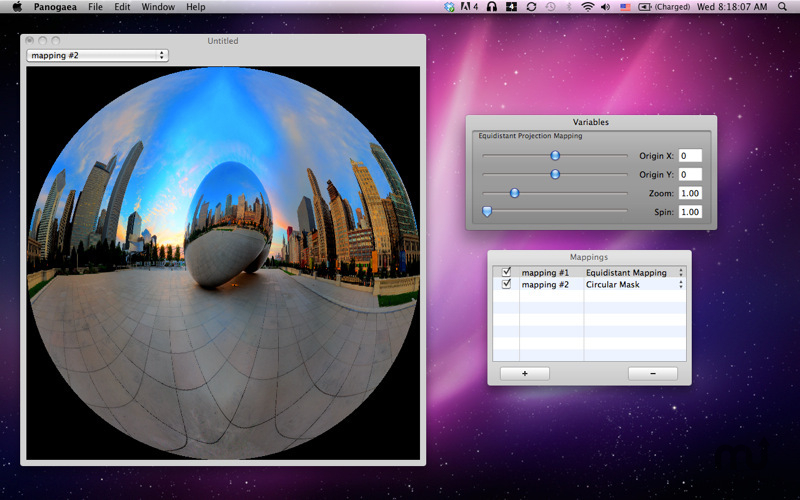 Panogaea takes your spherical panoramas to the next level by letting you cascade an arbitrary number of distortion mappings together and see the results in realtime as you vary their parameters. Adds a user preference to limit the maximum number of megapixels of an image when saving to disk. This can be used to prevent the application from freezing if the system runs out of memory. Reduces the memory requirements for square-format images (stereographic or equidistant). Panogaea needs a review. Be the first to review this app and get the discussion started! Panogaea needs a rating. Be the first to rate this app and get the discussion started! Panogaea can load and save images in virtually every 8 or 16 bit image format. Although Panogaea was created with spherical panoramas in mind it can be used to manipulate and distort any kind of digital photograph.